As previously reported, The Flaming Lips are set to team up with Yoko Ono Plastic Ono Band for a pair of New Year’s Eve shows in the Lips’ hometown of Oklahoma City, Oklahoma. As Psych Explorations of the Future Heart points out, Wayne Coyne and co. recently prepped for the big gigs by covering The Beatles’ classic “I am the Walrus” at Oklahoma City’s Pink Floor Studio. The Lips design and film collaborator George Salisbury was on hand to capture the moment, and you can watch the video below. What follows is plucked from the middle of a fairly long trip of some sort. The band clang and bang their instruments to and fro, while cawing and nodding their heads through the warm haze of whatever they may be on. 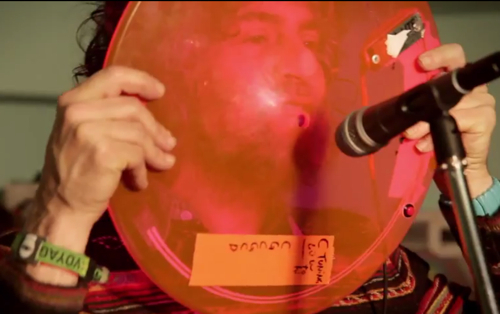 Frontman Wayne Coyne appears to be vibin’ particularly hard, whispering the song almost in slow-motion before he takes a lick of his orange disc microphone like it was a Creamsicle. Seems they all took the self-added ending of “everybody smoke pot” a bit too literal.